Some aspiring journalists dream of the big break, the big story. Some watch the weeks and months pass as editors ignore their pleas for jobs or freelance assignments. Some throw themselves into the gritty work of covering small-town school boards and zoning commissions on tiny dailies or weeklies. One decided to go to Somalia and live among pirates. It took Jay Bahadur 44 hours to get there, and that was the easy part. Everyone told him tales of the country, maybe the worst place on Earth, almost surely the most dangerous. You don’t go there for the shopping, or the sushi. You go there to get killed or kidnapped or to contract a dread incurable disease that won’t be diagnosed until you are dead, and possibly not even then. More than once Bahadur wondered why he went there at all. He went there for the reason journalists go anywhere - for the thrill of it, perhaps; to see what no other writer has seen, almost certainly; to bear witness, to be sure; for the story, most of all. And what a story it is. Jay Bahadur has borne witness and seen what no other journalist has seen. He has peeked behind the curtain of the pirates of Somalia in their faraway tribal homelands. I cannot repress adding this phrase: and lived to tell about it. And, as we are to discover, piracy today is swift work. “In attack groups spread amongst several small and speedy skiffs, [the pirates] approached their target on all sides, swarming like a water-borne wolf pack,’’ he writes. “They brandished their weapons in an attempt to frighten the ship’s crew into stopping, and even fired into the air.’’ Then, having hooked rope ladders onto the decks, they climbed aboard. The roots of piracy are privation and poverty, just as they always have been, and you can throw in a dash of daring if you have the turn of mind of a 19th-century novelist or a Gilbert and Sullivan-style librettist. But at base, buccaneering comes down to pure business, all the way to the venture funds some of the modern maritime vultures cultivate. 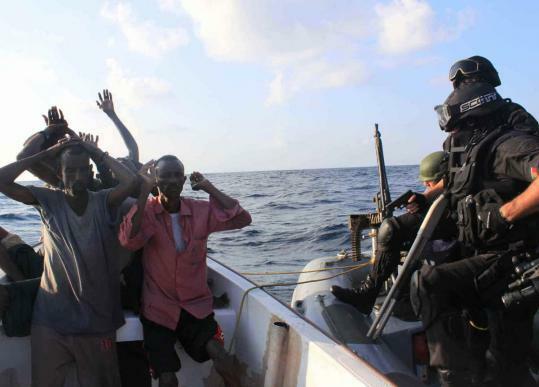 Bahadur spends considerable time debunking myths - that Somali waters are teeming with pirates, or that pirates are the tools of radical jihadists, or that they are part of an international criminal cabal, or that they have intelligence networks that rival none in Africa. All of these are beguiling, but all are false as well. Not false is the pervasive presence of khat, the intoxicating leaf whose stimulative powers are released by chewing or brewing - in short, by teeth or tea. It is both a means of exchange and the reason why so much time, so much effort, so much opportunity, is wasted in Somalia. “Time itself doesn’t seem quite real when you’re chewing khat; the activity is perfectly in tune with Somalia - the slow, lethargic chewing keeps pace with the plodding of the days, lives measured out in pulpy mouthfuls,’’ he writes. Not many recent college graduates could type a line like that. Bahadur paints a portrait of a place where persistent clans and corruption have prevented the development of a mature modern state, a desperate corner of the world where even street signs are stripped for the value of the metal. The way to end piracy, he says, is to end poverty. Even so, the risk of a ship being hijacked by pirates is miniscule - and, Bahadur says, international efforts have reduced the pirates’ success rate to about 30 percent. That said, as a partisan of the Pittsburgh baseball club, a group of ballplayers that was until recently so feckless they posed little threat to anyone, I am thinking that a team batting average of .300 would make the Pirates seem pretty formidable.